Key Difference: Yoga, a form of exercise and meditation, is most commonly practiced in India and is known for disciplining physical, mental, and spiritual forms. The most common yoga practiced in the Western countries is the Hatha yoga and its asanas. Yoga is most commonly associated with meditation and the ‘prana’ or ‘life’. It seeks to balance and relax the body, including joining the breath with the spirit. Tai Chi Chaun, or just Tai Chi, meaning “supreme ultimate”, is a soft martial art that revolves around a person’s ‘Qi’ or ‘Chi’ a life force that drives all living beings and forms. Tai Chi is Chinese meditation practice that is used to strengthen a person’s body and Chi. Yoga and Tai Chi are common exercising practices that are used by people. While both are beneficial forms of meditation and relaxation, they are completely different. While Yoga originates from India, Tai Chi Chuan originates from China. Yoga, a form of exercise and meditation, is most commonly practiced in India and is known for disciplining physical, mental, and spiritual forms. It is based on the Yoga Sūtras of Patañjali. Various traditions of yoga are found in Hinduism, Buddhism, Jainism and Sikhism. Early forms of meditative yoga have been dated back to the Indus River Valley in the 3rd millennium BC, when seals depicting figures in a common yoga and meditation pose were unearthed. Modern yoga became popular during the mid-19th century and was introduced by Swami Vivekananda, who toured Europe and the United States in the 1890s. The most common yoga practiced in the Western countries is the Hatha yoga and its asanas. Yoga is most commonly associated with meditation and the ‘prana’ or ‘life’. It seeks to balance and relax the body, including joining the breath with the spirit. It is also used in order to improve a person’s flexibility and build up strength. The teachings of Yoga are grouped into three parts: the physical aspect, mental aspect and spiritual aspect. While the physical aspect focuses on strengthening the body, the mental aspect deals with relieving stress and anxiety, along with fostering positive thinking and self-acceptance. The spiritual aspect deals with becoming one with the nature and the joining of the body and spirit as one. Different asanas of yoga are used depending on a person’s need. Yoga can be used for meditation, increasing flexibility, or burning calories. Yoga can also help fight cancer, schizophrenia, asthma and heart diseases; it also increases awareness, improves musculo-skeletal and mental health. It can also relieve stress, anxiety, depression and promote more happy thoughts. One should also be careful when performing the asanas, so that they do not over-exert themselves and cause injuries. Tai Chi Chaun, or just Tai Chi, meaning “supreme ultimate”, is a soft martial art that revolves around a person’s ‘Qi’ or ‘Chi’ a life force that drives all living beings and forms. Tai Chi is Chinese meditation practice that is used to strengthen a person’s body and Chi. According to Old Chinese medicine, the constant flow of Chi in a person is what keeps a person’s body healthy and fit. If the flow of Chi is interrupted then the body becomes sick. The practice of Tai Chi ensures that the Chi inside a person continues to flow without any disruptions. Tai Chi is believed to be originated some two thousand years ago and uses continual movement of the hands and feet as well as proper shifting of weight in order to facilitate movement of Chi through the body. The body has a center called the tan t'ien near your belly button where you relax your hands at the beginning and end of each practice to gather the Chi. In using Tai chi as a combat exercise; it follows the principle of yin and yang, a balance of opposites where soft is used to overcome hard. Similar to Yoga, Tai Chi focuses on a person’s breathing in order to release all the bad energy. Though, Tai Chi comprise of slow movements, it does not mean it cann be just as lethal as aggressive martial arts. Tai Chi training involves five elements, taolu (solo hand and weapons routines/forms), neigong & qigong (breathing, movement and awareness exercises and meditation), tuishou (response drills) and sanshou (self defense techniques). 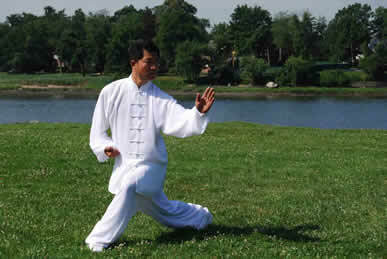 Neigong & qigong and Sanshou are the most popular forms of Tai Chi practiced today. Tai Chi styles such as, Yang, Wu, and Chen, also have secondary forms of a faster pace for movements. Tai Chi movements are proved to improve coordination, balance, strength and burn calories. It can also be used for relaxation, to relieve muscular tension and pain. According to research, continuous tai chi practice has shown improvements in people recovering chronic stroke, heart failure, high blood pressure, heart attacks, multiple sclerosis, Parkinson's, Alzheimer's and fibromyalgia. The only injury that can be sustained from Tai Chi is the tension building up in the knees from improper postures, so if a person feels tension and pain the knees while practicing, they should consult the master or try other poses that alleviates the tension. Tai chi is a type of internal (soft) Chinese martial art practiced for both its defense training and its health benefits, such as control, balance and reliving stress, anxiety and depression.